Fotografico Photography Template has 19 animated pages including the main page, A unique layout with content that is simple but useful. A custom Mp3 player that can be either on or off onLoad with song list. 3 photography package pages, 4 gallery set ups for different genres, about us, blog, single blog, single video, image tip, flex slider, our team, credits, read more, 404 and contact pages. A dark photography theme Could be customized very easily by changing png images and simple color changes in the css. Comes with a help file that should explain all the parts of the template and how to make it your own. 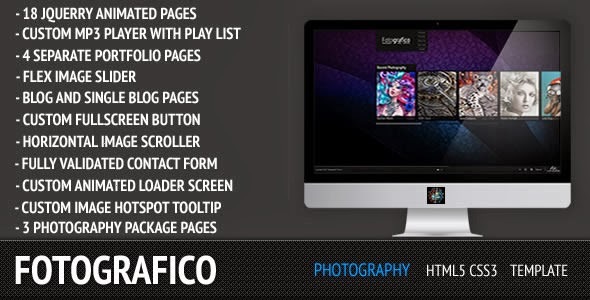 Item Reviewed: Fotografico - Beautiful Photography Template 9 out of 10 based on 10 ratings. 9 user reviews.